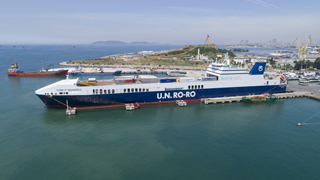 U.N. Ro-Ro, one of the largest ro-ro operators in the world, with 12 vessels and a trailer capacity of 2926, turned their long-time partner to Alfa Laval to sign a Performance Agreement. The agreement maximizes availability and uptime as well as improves separation efficiency. This contributes to cost savings as peace of mind. U.N. Ro-Ro signed an Alfa Laval Performance Agreement to reduce operating expenses, establish fixed- cost maintenance and conduct preventive maintenance at defined intervals. The agreement covers the execution of all on- and off-board services for 36 separation systems over a specified period of time. The Alfa Laval Performance Agreement reduced U.N. Ro-Ro’s annual maintenance costs.These savings were achieved by conducting preventive maintenance along with the implementation of bowl and VDD exchange services on a regular basis to ensure maximum sep- arator uptime and minimum on-board service time. Preventive maintenance and exchange services ensure continu- ous separator operation. This enables the crew to focus their core business – ensuring safe and timely transportation of wheeled cargo. The Alfa Laval Performance Agreement not only ensures maximum uptime, but also provides easier budgeting and cost control. The Performance Agreement safeguards the operation of its Ro-Ro vessels through services that opti- mize separator system performance. U.N. Ro-Ro Technical Manager Murat Keskin is pleased that the maintenance budget will be fixed. Critical spare parts delivered fast The scope of the Alfa Laval Performance Agreement for U.N. The scope of the Alfa Laval Performance Agreement for U.N. Ro-Ro includes a strategic service called Exclusive Stock, which ensures critical spare parts are strategically located to provide the ultimate avail- ability and to reduce administrative expenses. This helps protect the profitability of the business. Alfa Laval Service in Turkey stores critical spare parts and service tools for U.N. Ro-Ro. To secure the availability and fast delivery in case of emergency, the most convenient answer is the Exclusive Stock. According to Keskin, Alfa Laval has proven that the trust earned as U.N. Ro-Ro’s long-term service partner is well deserved. With the Alfa Laval Performance Agreement, U.N. Ro-Ro is able to reduce operating expenses, conduct preventive maintenance at defined intervals and have total cost control for separator maintenance. Relying on Alfa Laval’s know-how and experience for the separation systems on board the ro-ro operator’s vessels helps U.N. Ro-Ro make more money/ boost revenues in the long term. Alfa Laval has tailored a service solution that meets our requirements for high separation efficiency and maximum uptime. We are confident that our partnership will continue to deliver measurable savings and peace of mind.